Blackpool Stanley became sole lease holders for the building at Kingscote Park , Layton in Blackpool in March 2013. Although some works to secure the building and make it water tight has been completed in partnership with Layton Juniors FC prior to this date the bulk of the work to complete the building and make it useable has been completed since March 2013. 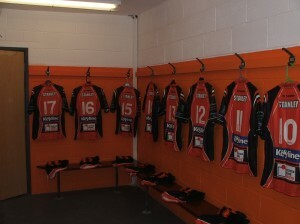 The Club room side of the building has been in use for hospitality at all home games in 2013 with the club room itself, the kitchen, servery and toilets being available. There are some remedial tasks to complete in the close season which will finish the project work on what is being termed the “dry” side of the building. The main tasks to complete are fit out of the bar and installation of carpet and floor coverings in the club room and corridors. 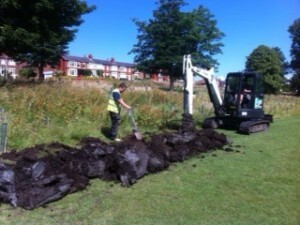 One of eight 100m long 1.2metre deep trenches being dug in the pitch to accommodate ground source loops. In addition to the above, Read and Errington in association with Groundheat Installations Ltd are installing a £25K heating and hot water system which should see us generate sufficient energy to supply the building with all its heating and hot water requirements without the need to pay a bill for the next 20+ years. We expect to see the heating and hot water systems fully installed by the turn of the year ready for use at the start of the 2014 season. The “wet” side of the building, including changing rooms and showers represents the second phase of the project. Much of the preliminary works in this area has been completed with new home, away and officials changing rooms having already been laid out, water for the shower area restored, electrical re-wire completed, ventilation ducting and fans installed and insulation to the walls and ceilings completed. Much of the work to paint the changing rooms, fit benches to the changing rooms and tile and fit out the shower areas is planned for the close season. 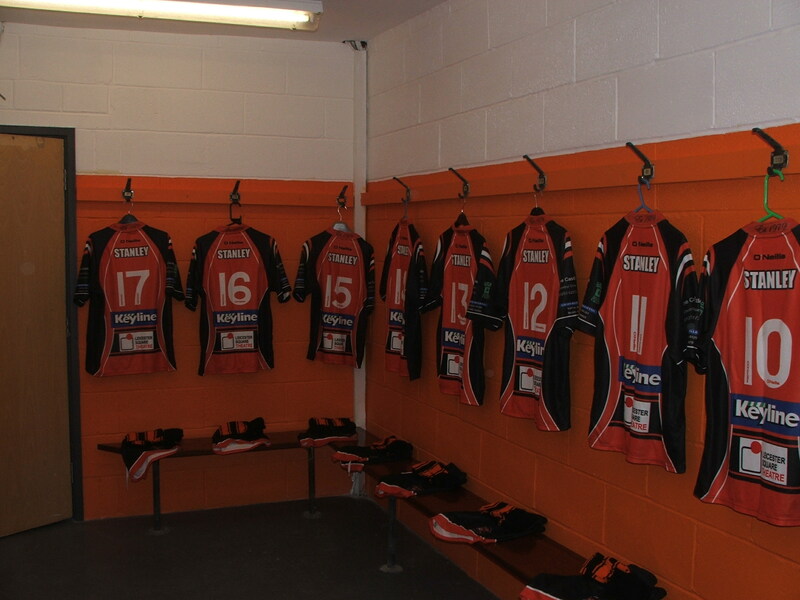 At the end of 2013 the stages which included the decoration and fit out of the changing rooms has been completed. The carpeting and covering of the floor areas on the dry side of the building has also been completed. Club memorabilia and other club related décor has started to be added to the club room. Plans for the early part of 2014 pre season are to complete the shower area for use on training nights prior to the establishment of playing surfaces at the park. 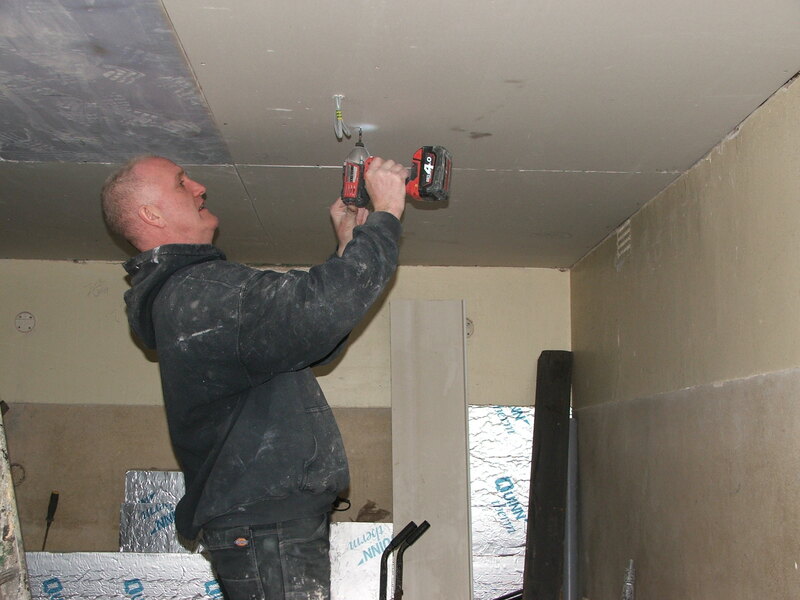 In January 2014 the project has progressed to the installation of new electrical cabling, ventilation ducting, insulation and fixing of a new ceiling to the shower and wash room areas of the club house. Pictured is Stanley stalwart Rick Taylor who having played for the club for a number of years has been keen to get involved in the renovation project. During the spring and summer of 2014 the project moved in to it’s final stages and completion of the structural improvements to the building. The main area of works concentrated on the shower room area where the old male changing room was completing transformed from a tired and shabby old shower area to a modern wet room with toilets and hand washing area. The shower room previously housed four showers, two toilets and a hand basin, the new wet room accommodates 10 showers with a further two individual showers accommodated separately, the old toilets have been replaced as has the old hand basin/sink. In addition to this a cleaners sink has been installed for use when the showers and changing areas are being cleaned and this will also be used by teams (home and away) for the filling of water bottles etc. 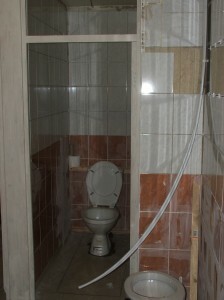 The entire shower area has been fully tiled, appropriately in the club colours. Both Blackpool Council and Read and Errington played a significant part in helping complete the wet room. During the commissioning of the wet room the Ground Source hot water system was switched on and tested. The 3000 litres of hot water generated by the system is fully available for use in the shower area. The energy generated by the system when fully operational generates income for the club through its accreditation to Ofgems non domestic RHI scheme. This additional income helps fund the energy requirements of the building not covered by the Ground Source System, for example lighting and appliances powered by standard electricity. The work to the shower area was completed by the end of the summer 2014 when the project was able to complete the fire safety, emergency lighting, electrical safety certificates etc necessary for the final sign off by the council of Building Regulations. Once Building Regulations were signed off, in accordance with the terms of the lease, The club were able to complete all the necessary requirements of the insurances for the building. During the winter months of 2014/2015 the project will look to complete any outstanding tasks including any snagging and close. With the closure of the clubhouse project the club will look to ongoing improvements of the building and maintenance of the clubhouse completed by the project.